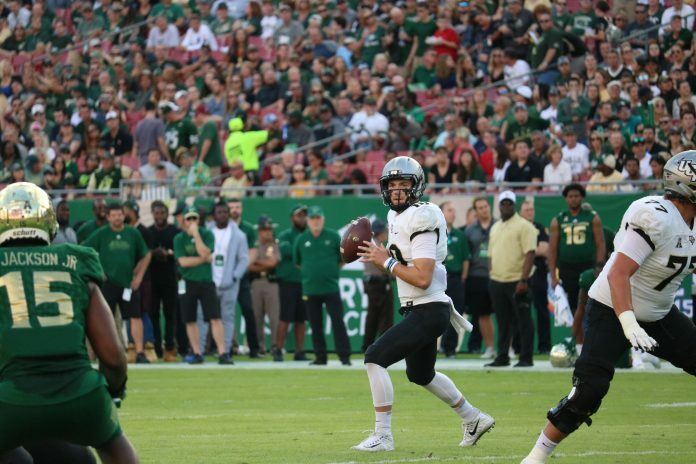 The University of Central Florida earned a win in 2018’s last regular season game over the USF Bulls 38-10 and its second straight perfect season. The news of the day came in the second quarter when UCF quarterback McKenzie Milton went down with a gruesome leg injury. Milton was scrambling on a QB keep and went head over heels. Immediately it was evident that the star QB was in pain. No further details are available about Milton’s injury. The Knights continued that drive when Milton went down and eventually sealed it with three points. Before going down Milton had an impressive pass in the first quarter that was good for a touchdown. Knights seemed to rely heavily on the run game after Milton went down. The Knights had 5 pass attempts in the third quarter completing only 2 compared to 10 in the first quarter with Milton completing 50%. Backup QB Darriel Mack Jr. was able to hold down the offense and keep the lead for the remainder of the game, the question is can he do it for the championship and bowl games. Knights have two other QB’s on the roster behind Mack including Hayden Kingston and Quadry Jones. UCF’s defense seemed to pick up where it left off last week against Cincinnati. They had a strong outing allowing only one USF touchdown all game. What future loomed over fans and players took hold and the Knights offense struggled to play with the same energy as in previous matchups. USF found the key to scoring momentarily as they ran the ball up the middle again, and again, and again past the defense to earn their first touchdown of the game. In the fourth quarter, however, the Knights offense paved way for two touchdowns to break away and win the game. The was the second largest attendance in the history of the War on I-4 with 57,626 fans in attendance. Stay tuned for the full game summary. The Future of UCF Football is with QB Darriel Mack, Jr.